CDI and SIRE reports can be downloaded from the respective web portals and imported with just a key click into 3D. Each report could be entered on board into special InfoPath forms and transfered as e-mail attachment into 3D via the office. Inspection data can be imported now automatically. 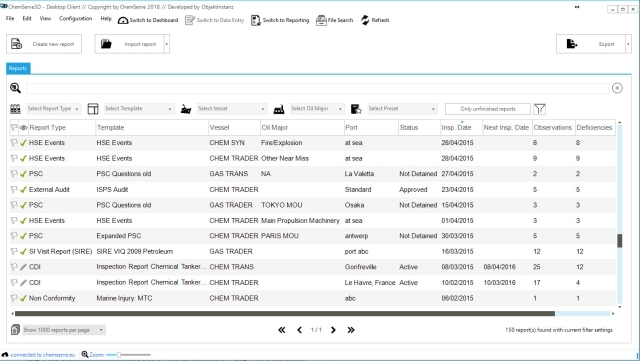 Ship inspection reports are available from OCIMF as xml-files. These xml files can be imported into 3D with jsut a few key clicks. Follow up target date and a close out date can be added to each defciency, if required. Attributes like Severity, Cause and Responsibility can be defined for each deficiency. Inspection data can be imported from your local ISIS Database with just a few clicks. Also here for each defciency a follow up target date and a close out date can be entered. Attributes like Severity, Cause and Responsibility can be defined for each deficiency.